Access by fob to 510-Dock at Marina Bay Yacht Harbor and use of premium 510-boards, paddles and leashes. Paddle hours: dawn to dusk. The 510-Dock is located on F-Dock in the protected harbor in Marina Bay Yacht Harbor. This is a great protected cove to launch from, do a paddle sprint work-out or get your sea legs back before venturing out. Memberships are for individuals, they are non transferable and non refundable. Discount: Pay twelve months in advanced and receive a discount of $150. Membership hold: 510-Dock Memberships can be put on hold for a maximum 2 months per year in one month increments. There is a $20 monthly hold charge. Membership Cancellation: Notice of 14 days is required before the next billing cycle. Guests: 510-Dock Members can bring one guest one time per month. Guest must have either taken our 510-SUP Intro class or has passed our paddle assessment test prior to their first time paddling with a member. Guest must have on file with 510-Waterline a signed waiver and release of liability. After your once a month guest pass is used you can have additional guests come paddle with you for a $25 rental fee for a 2-hour paddle. Members and their guest can purchase a guest pass online through our TeamUp Store. Orientation : You will be given a complete orientation about the dock and how to use it. ALL MEMBERS MUST KNOW HOW TO SWIM. 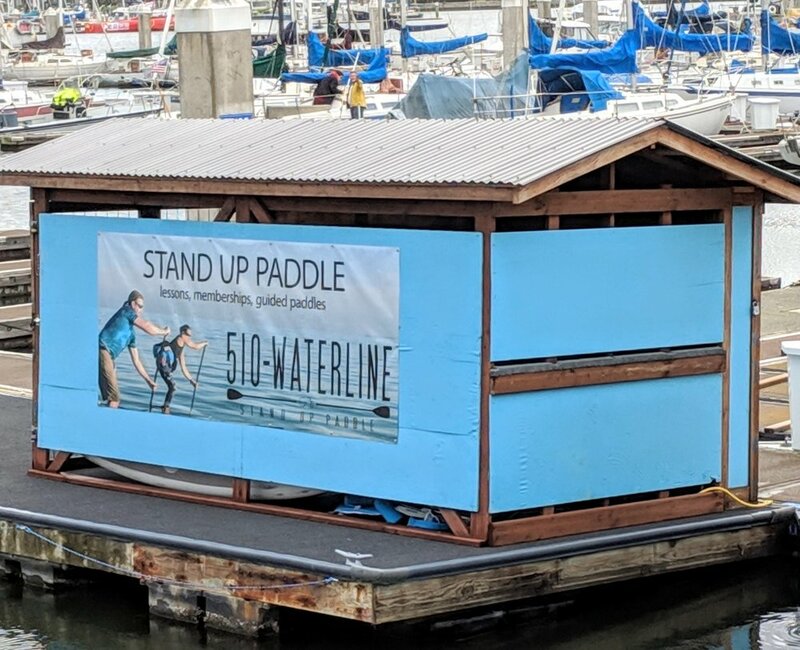 Your 510-Dock Membership allows you to come down to the dock and take a board out anytime you want to paddle! 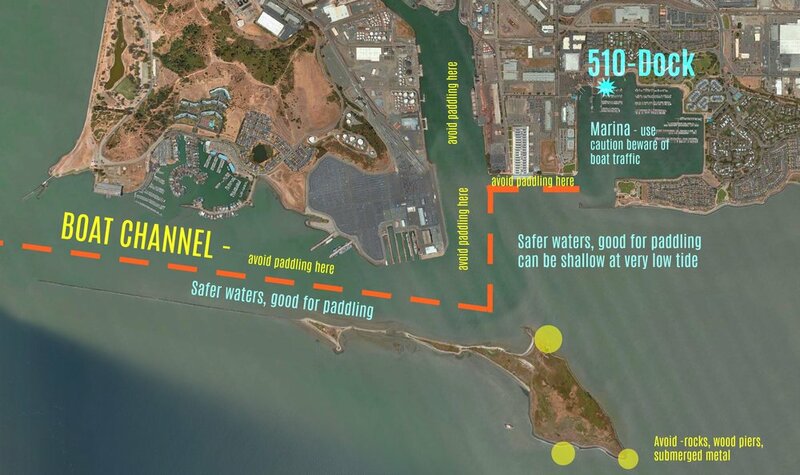 The 510-Dock is located in the protected harbor across from Salute e Vita Ristorante in Marin Bay Yacht Harbor. This is a protected cove to launch from, do a paddle sprint work-out or get your sea legs back before venturing out. Beyond your paddle...The added benefits beyond the obvious is that the dock is a great place to have a picnic after your paddle, hang out enjoying the calm harbor, on your own or with new and old friendships on it's cozy carpeted dock. Grab some ice and chill. Busy waterways have lanes of travel - ALL of the San Francisco Bay is busy; it’s marinas, channels, estuaries, canals. Know the area you plan to paddle. Buoy markers will line a channel on either side, when returning to harbor a boat must keep the red channel markers on it’s right side and the green channel markers to it’s left (Red Right Return). This will help you know where you should expect larger boats. The depth of the channel may limit deep draft vessels. Deep draft vessels cannot maneuver out of these waterways, you can and must stay out of their way. You should only paddle in a boat channel to get across it. If you must paddle in a channel stay to the far side, do not paddle in the middle of the channel. The safest place to paddle is outside of boat channels. If you do get caught close to a larger, faster vessel aim for the back of the boat. As you encounter the wake turn the front of your board into the wave, get to your knees if you feel unsteady. You are much less likely to fall off if you take the wave head on, not from the side or from behind. In the marina area paddlers do not have the right of way. As a paddler you must give way and get out of the way of all boats. WE HAVE MANY BOARDS TO MEET YOUR PADDLING NEEDS! $30 per hour. Two hour minimum. After two hours we charge by every half hour. Rentals include Stand Up Paddleboard, Paddle, Personal Flotation Device (PFD), Leash and Safety Whistle. ALL RENTERS MUST KNOW HOW TO SWIM. AT LEAST 24 HOUR ADVANCE RESERVATIONS ARE REQUIRED. Email or text 510-333-0365 or 510-517-3318 to reserve your board. Please include your paddling experience so we can best suit your needs. You may be required to take our 510-SUP Intro class or a paddle assessment before renting. We reserve the right to refuse service or cancel reservations due to weather and tidal conditions or if we feel renters will be unsafe. On site paddling only out of Marina Bay Yacht Harbor. Must be 18 years or older. If under 18 a parent or legal guardian must be with you at all times on the water. Minimum age - 13 years old. Renters must wear the leash provided and have the provided PFD and safety whistle on the board. SUP riders 13 years and older are required to have PFD on the board. All renters must carry a cell phone in a water proof bag/case with them. All paddlers must follow Marina Bay Yacht Harbor and Coast Guard boating and water safety rules.